Hello everybody! (Whenever I say that I have Grover from Sesame Street saying it in my head, is that weird? BTW: The Monster at the End if This Book about Grover is a really fun book for young kids). Anyways, I really wanted to get a card in for the Wild Orchid Craft challenge this week, yet it was Autumn colors and I don't do well with those. But, I noticed a beautiful WOC DT project that used gold/yellow and blue. I thought it was perfect for me, especially since I live here in beautiful San Diego and fall is still about sunshine and ocean! I used the Papertake Weekly sketch, which I really love! After coloring the cute image from Saturated Canary, I realized the colors are San Diego Charger colors. How perfect, yet corny! Hope you all like it and have a fab weekend! OMGoodness, you certainly learned well from Alyce--the hair looks fabulous, as does the rest of your coloring! This is such a darling card--love the design, papers, stitching, colors (even if they are Chargers' colors, LOL), die cuts and embellies! Beautifully colored image. 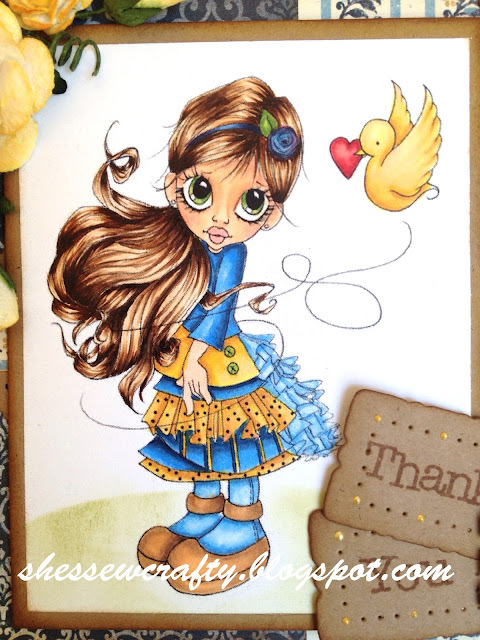 Sweet card and lovely details! Glad you joined us at Simon Says Stamp and Show. Such a stunning card. Beautifully coloured and the hair looks fabulous. Absolutely gorgeous card, fabulous colouring.